I know it wouldn’t seem like it, but if you want to feel motivated to do big and exciting new things and to take chances, you should read a book about shame. Ok, don’t just read any book about shame. And really, don’t read a book JUST about shame. Read one that is about getting rid of shame and being vulnerable. Just go read Daring Greatly by Brene Brown. The book looks small. It’s only seven chapters, but there is a lot packed into those seven chapters. I grossly misjudged how long it would take me to read. Not because the reading was difficult, but because there was a lot to absorb. Plus the reading was definitely engrossing, and my time to let myself be engrossed in things is in short supply as of late. 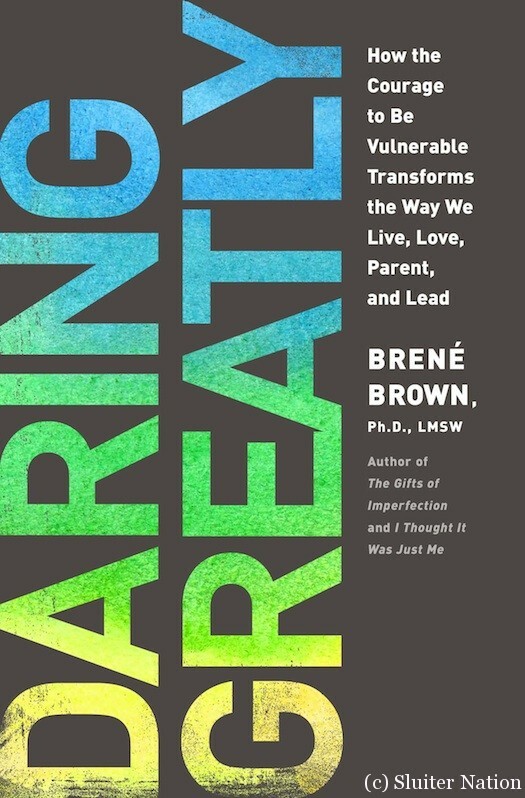 The subtitle of the book is “How the Courage to Be Vulnerable Transforms the Way We Live, Love, Parent, and Lead.” I do all four of those things, so I jumped on this book (plus I really love Brene Brown). The first few chapters are devoted to Brown leading the reader through her shame research–how shame gets in the way of our letting ourselves be vulnerable. These chapters also focus on myths of vulnerability–what being vulnerable is NOT. The next part of the book moves into all the ways we throw up barriers so no one sees our vulnerability, while also giving strategies for how to shed that armor. The last chapters help us apply what she has taught us to the work place and to our family life, particularly with parenting. It’s a legitimate concern to think that a book by a PhD on “research” is going to be heady and full of jargon. Luckily, it would be an unfounded concern. Brown has a very conversational, easy way about her reading that makes you feel like you are having a cup of tea with a friend who just happens to be a professional shame researcher. She shares personal stories and anecdotes from years of experience. This book is important. There is so much in this world telling us that we are not good enough, not skinny enough, not beautiful enough, not mom enough, etc. We begin to believe this message and we begin to carry around shame. Yesterday I looked at the faces of my teenage students as they walked the halls–they already carry this at their young ages. Brown stresses how it’s ok to feel our feelings, but we need to become “shame resilient”; we need to believe we are enough. I found myself relating on many levels: as a mother, teacher, wife, woman, writer. I found my purpose for why I blog written more eloquently than I could ever say it:”Shame hates having words wrapped around it,”Brown writes (67). I found myself underlining this in ink and flagging it. Yes. This is why I blog. This is why, even when I feel like maybe I am the only one…maybe I’m not. Maybe if I say it, the shame will be lifted and something else…something good…can replace it. The biggest misconception is that to be vulnerable and share your shame is weak. That is shows that you are less. 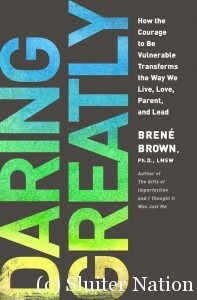 The book’s message on this is clear: “Vulnerability sounds like truth and feels like courage” (37). I encourage you to pick up this book and follow our discussion about it at BlogHer Book Club. I was compensated for this review by BlogHer Book Club, however all opinions are my own. Sounds like an amazing book. So glad you got so much out of it. i am buying this TODAY. i love Brene and loved her on the Katie show last week (did you see it?) and really need to take her words to heart. thanks for sharing this! Erin, you will LOVE this book. It sort of makes you want to go out and be all vulnerable and stuff…but in a good way! I’ve been intrigued by Brene Brown ever since I saw her TED talk over a year ago. I’m hoping to snag this book through the library soon. I hope you do too…it’s an awesome read. So glad that you enjoyed it too! It took me a bit to get into the non-fiction vs my usual lighter fiction. But I too got caught up in it. And kept thinking ‘Yes! This is why I blog!’. Right? And being back to work doesn’t help my brain much for concentrating. By the time I get home I want some mush reading. But this was so good. I was glad I signed up for this one for sure. I jotted down a LOT of quotes from this book to have handy when I am having a hard time with a hard subject when I am writing. I had the same experience you did — I needed to spend time with the ideas in the book to really absorb them. I feel a little unleashed after reading it! YES! feeling “unleashed” is exactly what I felt after. I felt…changed and free! I met Brene Brown once. She’s kinda my favorite. Whoops. Not enough coffee yet this morning… I am planning to request…. Here’s Brene Brown at BlogHer (were you at that break away session, too?) was awesome, I really want to read this!